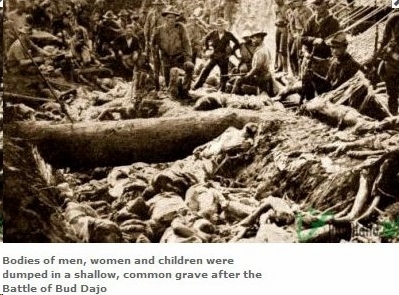 Last March 7 was the 105th anniversary of the Battle of Bud Dajo, the massacre of some 600 Moro men, women and children by the officers and men of the United States Armed Forces, with some (Christian) Filipino soldiers. In 1999, I wrote a newspaper article on this episode of Moro history to commemorate the centennial anniversary of the Bates Treaty. Below is the article published in The Philippine Post, a now defunct Philippine national daily newspaper, on Aug. 31, 1999. On Aug. 20, a symposium on the Bates Treaty was held in San Francisco to commemorate its centennial. The Philippine-American War Centennial Initiatives (PAWCI) was one of the organizers of the event. One hundred years ago, on August 20, 1899, Brigadier General John C. Bates, representing the United States of America and His Highness Sultan Jamal ul-Kiram II of the Sultanate of Sulu signed what has since been known as the Bates Treaty. US President McKinley approved the accord two months later. The Sultan agreed to acknowledge the sovereignty of the US while the Americans agreed to respect the rights and dignities of the Sultan and the datus, not to interfere with religious matters, protect the Sulu archipelago from foreign waters and even pay the sultan and his privy council monthly salaries. The treaty was a great tactical move by the US. It allowed American generals to concentrate their might in Luzon, where the Tagalogs under Aguinaldo were giving them a good fight. The US policy of attraction was such a success that the normally combative Taosug datus became complacent. But then came General Leonard Wood. Mr. Wood , a close friend of Theodore Roosevelt, was famous for organizing the Rough Riders and for capturing the celebrated Apache chief, Geronimo. 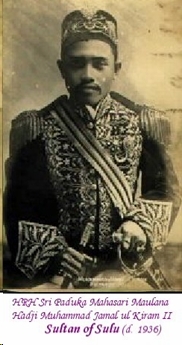 He was appointed Governor-General of Cuba in 1899. A few years later, he became the first governor of the Moro Province. He immediately imposed a “mailed fist policy”. He had no intention of treating the Moros as equals. He immediately worked for the abrogation of the Bates Treaty. In June 1903, he ordered that all Moros pay a cedula tax of P2.00 (two pesos) per head. Paying tribute to a foreigner was anathema to the average Moro. It was a sign of submission. The Sultan pleaded not to enforce such a policy. But General Wood insisted. At first, the Sultan offered to pay the tax for all his subjects. But Wood wanted the Moros to live by his (Wood’s) law. He worked to abolish slavery and vigorously fought piracy. He also forbade the Moros from carrying arms, whether pistols or blades. Non-Moros, on the other hand, could carry gatling guns if they wished to. A Moro without a kris (!) — the idea was quite preposterous to the Moro minds. The Moros cried “foul” and took up arms — in Lanao, in Maguindanao, in Buayan, in Basilan and in Sulu. The battles, massacres, assassinations, sieges, uprisings etc. that ensued were too numerous to mention. But there were some that caught the attention of the US press. One of them was the Bud Dajo massacre. In 1906, the Taosugs were quite disenchanted with their Sultan and prominent datus. They hated the Americans and their US-made laws. When the US military patrols came to collect tax, they ran to the nearest jungle or hiding place. Bud (Mt.) Dajo is a lava cone of an extinct volcano at an altitude of 2100 feet. The crater in the summit has a circumference of 1800 yards. The crater was a natural fortress; hence, a favorite shelter or hide-away for Moro “tax evaders”, who were mostly poor people. Soon families were staying in the crater. By March 1906, more than a thousand Moros — men, women and children, made their way to the crater. Gen. Wood would not have any of this nonsense. He ordered his officers to gather in Jolo. Col. Duncan with about 800 officers and men from the 6th and 19th infantry, the 4th Cavalry, the 28th Artillery Battery, the Sulu Constabulary and sailors from the gunboat Pampanga, armed with mountain guns, rifles, bayonets, fast-firing pistols and grenades launched the assault on March 5. The thousand or so Moro men, women and children were armed with kris, barungs and spears. By March 7, the smoke of battle had cleared. The people in the crater fought bravely, to the last Moro. There were no survivors. It was a complete massacre. The Americans lost two dozen men and some seventy wounded. Gen. Wood reported to the Secretary of War the success of his mission. According to his report, the Moros lost 600 men, women and children while the US lost only 18 men and 52 wounded. Fathers and mothers and boys and girls and black-eyed babes. Into the crater of death Drove them — six hundred. while All the world wondered. Stifled by the cannon smoke, Men, women, children choke. What shall such bloodthirst slake? Go ask Hell Roaring Jake Whether Wood blundered. Honor the charge they made Honor the Wood Brigade, For that six hundred. In 1921, Leonard Wood was appointed Governor-General of the Philippines. He served as such until his death in 1927.